It’s October 3, 1933 and a young man, a fighter, lies close to death in a hospital bed in Macon, Georgia. The room is quiet, morose even, such a contrast to the thrill seeking, 100-mile-an-hour life that he had led. The dying man is a mere 28 years of age. The physicians believe his ‘tremendous vitality’ is the only thing that keeps him from passing, but soon it is apparent that won’t be enough. The young fighter cannot win this battle and he dies with his wife — a patient in the same hospital, having just given birth to their third son — at his bedside. His last words are, “I am going, old girl,” a final goodbye to his beloved wife. William Lawrence Stribling Jr,. or Young Stribling as he was known in the ring, lived his short life to the fullest. From fast cars, planes, speedboats and motorbikes, to taking on a plethora of the best middleweight, light heavyweight and heavyweight contenders the fight game had to offer, he lived fast and, sadly, died young. 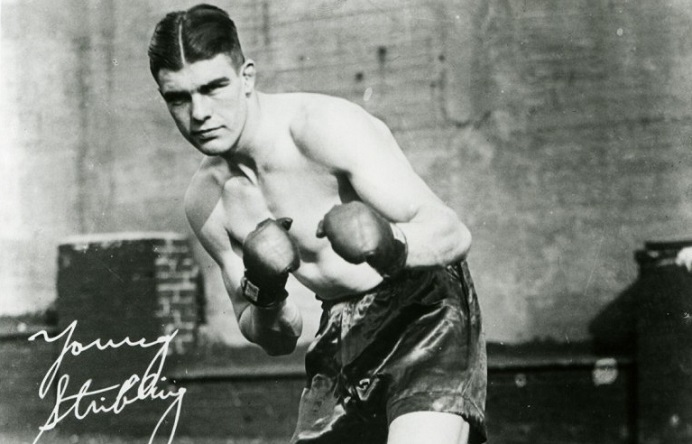 Despite his young age, Stribling was a veteran of close to 300 bouts when he died. His fistic career began as a featherweight in 1921 when he was just 16-years-old before be eventually moved up to the light-heavyweight and heavyweight divisions. He competed in various countries during his 12-year career, including Cuba, England, France, Australia and South Africa, as well as all over the United States. Despite the defeat, Stribling continued to compete with a frequency unheard of in today’s fight game. He racked up victories over fighters both good and bad, including a rematch win over McTigue in March of 1924, a six round draw with future champion Paul Berlenbach, and a six round decision over future Hall of Famer Tommy Loughran at Yankee Stadium, a match appearing on the undercard of the Harry Greb vs Ted Moore fight and witnessed by some fifty thousand. A young Young Stribling poses with Jack Dempsey. It was in 1925 when Stribling was dubbed ‘The King of the Canebrakes’, a moniker given to him by famed sportswriter of the times Damon Runyan, in reference to his popularity in rural areas. This popularity was far from unanimous though as Stribling was one of the many boxers of the time to draw the colour line, refusing to take on black challengers. Many of the young Georgian’s fights were against lesser quality opposition but he was a fan favourite, if not for his performances, then for his bravado outside the ring. He wasn’t adverse to a publicity stunt and one of the more famous ones occurred when he flew a plane over New York City and circled the Empire State Building. Not all of Stribling’s opponents were pushovers though. He defeated Tommy Loughran for a second time in March of ’25, went 2-1 against Jimmy Delaney, beat Johnny Risko in July of that same year, and in 1926 went 1-1 with future Hall of Famer Jimmy Slattery. Stribling trained hard and came in at a slim 171 pounds while Belenbach weighed in at 174.5. The training methods employed by the challenger were questioned by the State Athletic Commission’s own doctor who declared that Stribling had “killed himself” to make 171 pounds. The decision after 15 rounds was a unanimous one and Stribling had once again fallen short of winning a world crown. 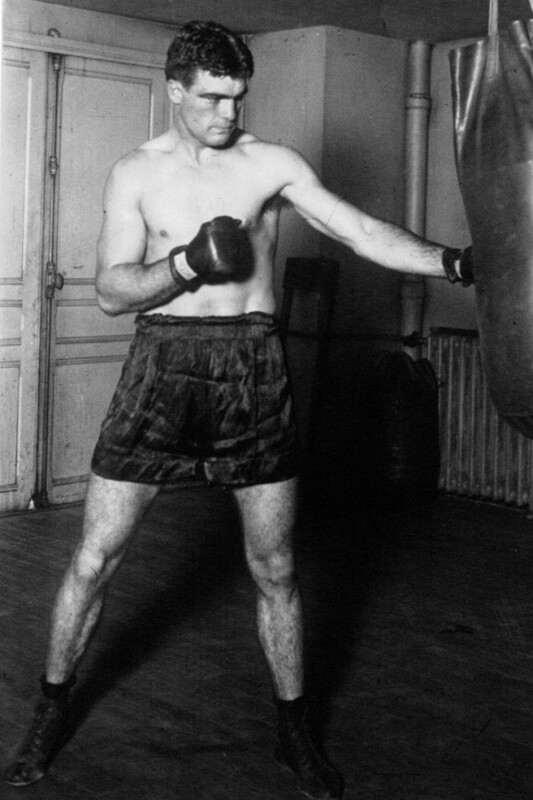 But he fought on and returned to his winning ways, beating his next 17 opponents, including the likes of Hall of Famers Battling Levinsky and Maxie Rosenbloom. Tommy Loughran was the man to halt the streak. In May of 1927 the light-heavyweight boxing master won a unanimous decision over Stribling at Ebbets Field in Brooklyn, New York. But Stribling was now taking on much bigger men and it was paying dividends. The heavyweight scene had always been boxing’s jewel and with it came fame and fortune. Stribling and his manager, who happened to also be his father, initiated an audacious plan to seize the heavyweight championship of the world. 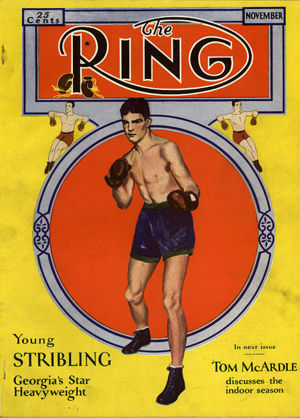 After an 18 month period in which Stribling fought 57 times and suffered no defeats, he became the number one contender as ranked by The Ring magazine. Gene Tunney, the man who took the title from Jack Dempsey, had retired in July of 1928 and the search was on for a new champion. 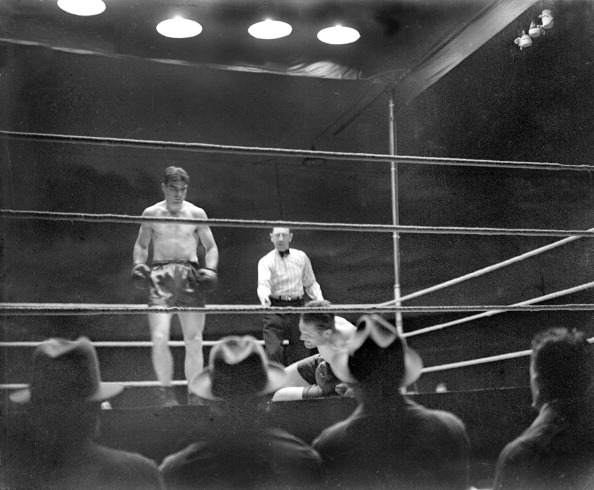 Promoter Tex Rickard set about staging a series of bouts to crown a new champion and Stribling was to play his part. At one point he had been matched to fight Tunney but the financial arrangements had fallen through, so upon hearing of Tunney’s retirement, Stribling’s father laid a claim to the title based on Stribling’s defeat of Johnny Risko and the two wins against Australian heavyweight Gene Cook, who had twice beaten Tom Heeney. On February 27 of 1929, Young Stribling got his first real chance to prove he was indeed worthy of the title of heavyweight champion when he faced Jack Sharkey in a ten round bout in Florida. The match was to be the last one organized by the larger than life Tex Rickard, who had passed away on January 6th of the same year. 35 000 attended and the thunderous applause began even before the main event as the referee for the bout, Jack Dempsey, was introduced to the packed house. Stribling falls to Primo Carnera in their first meeting, which likely was not on the level. The loss put Stribling out of the title picture but that didn’t stop him from frequenting the ring; he fought on with much success and for the remainder of 1929 and 1930 lost just two fights, both by disqualification. One of those occurred in November of 1930 against the mob-controlled behemoth, Primo Carnera. Stribling lost by disqualification but then won the rematch less than three weeks later in the same fashion. Both matches are thought to be fixed. With wins over heavyweight contenders such as Otto von Porat, Phil Scott and Tuffy Griffiths, men all ranked in the top ten in 1929 and 1930, Stribling secured the biggest fight of his career, a shot at the heavyweight champion of the world, Max Schmeling. 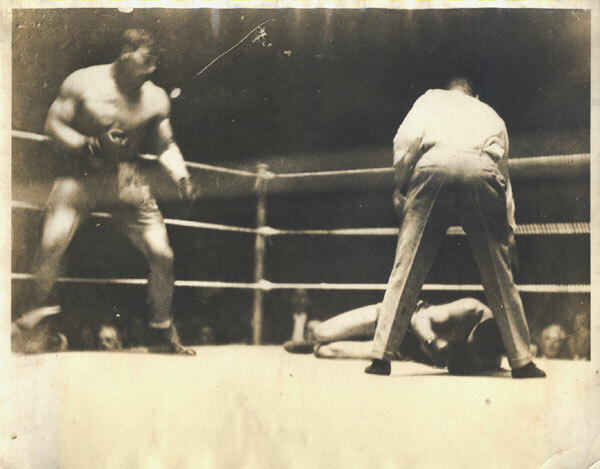 Stribling had his doubters and there were those who said he lacked the heart to compete with the better heavyweights, a view inspired by the safety-first approach on display in some of his higher profile bouts, but his second round knockout of Englishman Phil Scott convinced many he deserved a chance to face Schmeling. There was a fair amount of hype in the lead up to the fight, hype befitting that of a heavyweight championship bout. Much of it surrounded the issue of Schmeling’s apparent refusal to rematch Jack Sharkey following the the German’s controversial win to take the vacant heavyweight crown by disqualification. 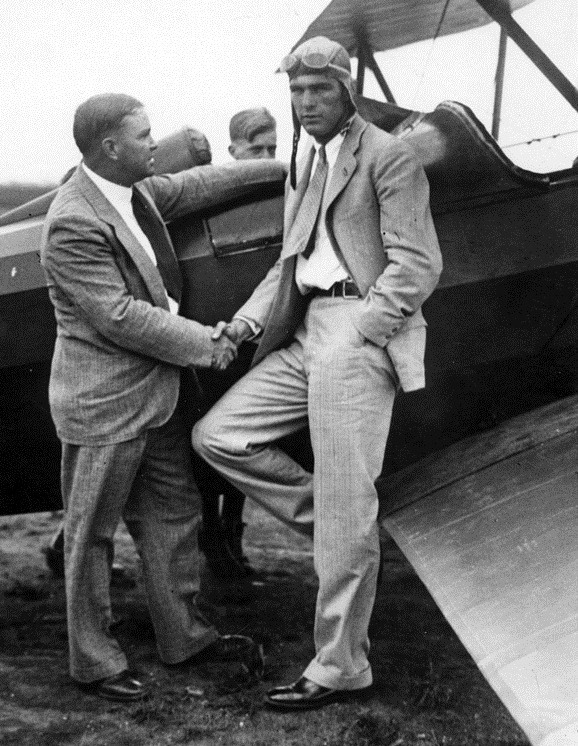 Stribling then created a stir in the lead up to the bout by flying his plane over the champion’s Pennsylvania training camp. 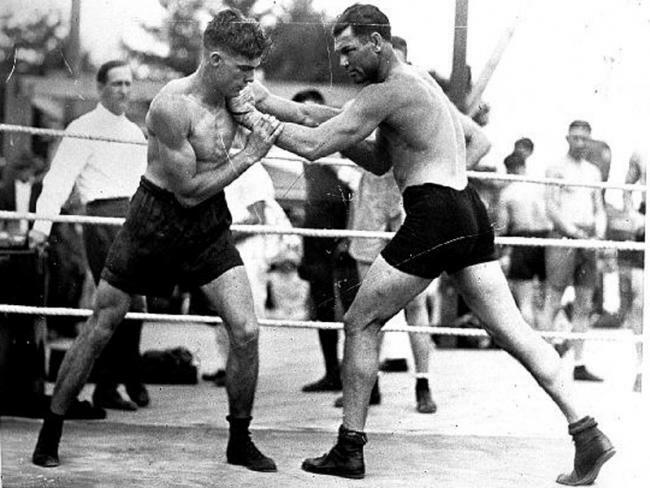 Stribling stands over Phil Scott during their 1930 bout. This win secured Stribling a title shot. The plan started off well enough as Stribling took charge and threw all he had at the champion, but after four rounds it was clear Schmeling’s punch resistance was more than up to the task while his own blows were taking a toll on the challenger. Stribling was a broken man by the middle rounds and he fell back to old habits of clinching, mauling and running to avoid further punishment. In the final round Schmeling dropped the challenger with a hard right to the jaw. Stribling was down for the count of nine but bravely fought on before Schmeling once again laid it on thick and, with 14 seconds left, referee George Blake stopped the bout to save the challenger from further punishment. The dream of becoming heavyweight champion, one that Stribling’s father had held dear ever since his son had been born, was shattered. Many suspected this was Stribling’s last shot at championship glory and they would be proved right. Despite this huge setback, Stribling was back in the ring just three months later and went on to win three bouts in succession, looking impressive against less than stellar opposition. But it was clear his days as a top contender were at an end when he faced heavyweight Ernie Schaaf in February of 1932 and was badly beaten over ten rounds. Only Archie Moore has more knockouts than Young Stribling. But Stribling fought on, competing in America, Canada, Australia, South Africa and France and losing just once, against European heavyweight champion Pierre Charles, via disqualification. His level of opposition was again questionable, but he did defeat the classy Australian Ambrose Palmer, albeit with a 16 pound weight advantage. Stribling fought his final bout on September 22 in 1933 against Maxie Rosenbloom, winning a ten round decision against the future Hall of Famer. Excellent article on a great fighter which was totally unknown to me. It’s time to see what other articles are lurking on this website. Hope you find many more to your liking. Please feel free to leave more comments. Thanks!